In the run-up to Armistice Day, Manchester's Central Library has been displaying a series of papers from World War One which show a different side of the conflict. The Disley papers are records of the Military Service Tribunals in the Cheshire town. Here men who wanted to be exempt from military service after the introduction of conscription in 1916 pleaded their case. When conscription was brought in, a national registration scheme identified about two million men of military age who had not signed up. Some 2,000 tribunals were set up across the country, but few records of them remain. Indeed, the National Archives say only two full sets of papers remain, one for the Middlesex Appeal Tribunal and another for Lothian and Peebles in Scotland, which were kept as "a benchmark for possible future use". Manchester Library's heritage collections manager David Govier says, though incomplete, the Disley papers debunk a misconception about those who did not fight - that they were all conscientious objectors. "I haven't found any conscientious objectors amongst the papers," he says. "There are dozens of individual applications for exemption from service from farmers and millworkers and people in reserved occupations. "There were also lots of people who were caring for family members, volunteering in hospitals or growing food on their allotments." That, says Imperial War Museum historian Matt Brosnan, is the reality of what the Military Service Tribunals dealt with. "Most of those who went to tribunals were for economic or work reasons. Men could be exempt if they were in work seen as essential to the war effort - such as specialist manufacturing, mining or farming. "They could also be exempt because of economic reasons, such as having a large family to support. "Of course, the most famous category of exemption was conscientious objection - because of political, humanitarian or religious beliefs." 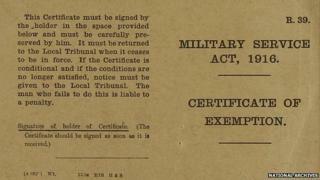 The Military Service Act 1916 allowed Great Britain to use conscription for the first time. It gave rise to the conscientious objector, something which Mr Brosnan says was "an alien concept". "The phenomenon was an unknown thing, but they were in a real numerical minority. "During the war, there were about 16,000 registered conscientious objectors, which sounds like a lot, but there was something in the region of eight million men in the armed forces." Those who did not want to fight had to go before the tribunals, though Matt Brosnan says the process was not always fair, due to the prevailing public opinion. "They were supposed to be made up of members who were impartial, but the system didn't always achieve that because by 1916, the war effort is in full throw and there was a huge wave of patriotic fervour. "The majority were supportive of the war and felt it was a necessary thing, so the members of these tribunals tended to reflect that." He says the panels were usually made up of eight or nine local dignitaries, "mostly men who did not have that much in the way of legal experience" and someone from the military. The hearings were, he says, "usually quite brief and didn't last more than about 10 minutes". "The person appealing was represented by a solicitor or maybe just a friend who could help defend them. "Their case was assessed and it was accepted or not. Both the applicant and the military representative had the right of appeal, so it could go to a tribunal after that, made up of members appointed by the Crown. "It was quite a large system." According to the National Archives, the majority of appeals were dismissed and many people did go on to see war service. However, some exemptions were granted, as the Middlesex Tribunals records reveal. John Shallis, for example, appealed on the grounds of domestic hardship, having lost four of his brothers during the war. His mother was described as a "cripple" on his appeal form, having broken her leg, and his father was away carrying out Home Defence duties with the Territorial Force. It was his work in munitions which tipped the balance though and he was granted exemption. Leslie Turner, from Manchester and Lancashire Family History Society, says anyone had the right to ask for an exemption, though "whether it was granted or not was another story". She says that in the Disley papers, one case stood out to her, that of print hand Clifford Carrington. "Against his name was the notation 'Or brother to go'. "His younger brother Harold must have drawn the short straw as he was sent to the front as part of the Prince of Wales' Volunteers (South Lancashire) Regiment 2nd Battalion. "Clifford's hearing was dated 25 October 1917. By 17 November 1918, records state that Harold Carrington had died of wounds. "I thought how awful it must have been for Clifford. "A colleague has since found a medal card for a Clifford Carrington - who joined the Cheshire Regiment. So it is likely he ended up joining the military anyway." Mr Brosnan says Carrington may not have had a choice, as even if men were granted exemption, it was often only temporary and as the toll of the war became heavier and heavier, the parameters of conscription changed. "In 1918, when manpower was even more of an issue, the age range was extended so soldiers who were 18 could serve overseas because of the dwindling numbers available. "Also, there were categories of war work that were essential that were reassessed. For example, some men that were working in mining in 1916 might be in the Army by 1918." Those who applied for exemption were also reassessed and if their situation changed, they might have found their argument for exemption rejected at a subsequent hearing. Conscientious objection was more likely to result in a permanent exemption, though Mr Brosnan says this came at a price. "The majority of people were pretty hostile towards them and pretty unimpressed by that kind of attitude. It was such an unusual thing and was going against the general view at the time. "They and their families and friends were poorly treated by wider society." However, he says men "who objected for political or religious reasons often came from communities of people of the same persuasion". "It wasn't just one or two that were conscientious objectors, there were several, so in their immediate surroundings, they would be more accepted than in the wider community." That was certainly true of cotton worker Euclid Thursby, who features in the Imperial War Museum North's Street to Trench exhibition. Mr Brosnan says Thursby came from Nelson in Lancashire, "a hot bed for conscientious objectors because of a left wing political community with strong links with the Independent Labour Party". "So within in his town, his actions would have been much more accepted and understood." Not everyone was so lucky and even those making economic cases could be vilified. The Middlesex records detail the case of Charles Busby, who asked to be exempt to carry on running his butcher's shop. An anonymous letter, sent directly to the tribunal, is attached to his case paper and questions why he was exempt while "married men have had to shut up their shop and go". It goes on to describe the butcher as "a proper rotter of a man" and a "rotten shirker". Nevertheless, he was granted exemption, though he did later serve with the Royal Navy and Royal Air Force between 1917 and 1918. It is estimated that by the end of the war, about one and a half million men had been exempt from compulsory service, either temporarily or completely. The exact number is not known, due to most records being destroyed in the 1920s. "I think the destruction of the tribunal papers was ordered as there was a stigma attached to those that did not serve," says Ms Turner. "Many of those sitting on tribunals were men from the same community and I think destroying these papers could have been considered the best way that an exemption from service would not follow any individual around all his life."